Looking for How to Make Homemade Canned Pickled Corn Relish - Easily! With Step-by-step Photos, Recipe, Directions, Ingredients and Costs in 2019? Scroll down this page and follow the links. And if you bring home some fruit or vegetables and want to can, freeze, make jam, salsa or pickles, see this page for simple, reliable, illustrated canning, freezing or preserving directions. There are plenty of other related resources, click on the resources dropdown above. So, here's how to can pickled corn relish! The directions are complete with instructions in easy steps and completely illustrated. In the winter when you open a jar, the pickled corn relish will taste MUCH better than any store-bought canned pickled corn relish! Step 1 - Get yer corn! Start with fresh corn on the cob - as fresh as you can get. If there is a delay between harvesting and canning, put it in the refrigerator or put ice on it. The sugars break down quickly at room temperature. According to the USDA, about 32 pounds (in husk) of sweet corn is needed per canner load of 7 quarts; an average of 20 pounds is needed per canner load of 9 pints. Note that a bushel weighs 35 pounds and yields 6 to 11 quarts of canned corn, which is an average of 41/2 pounds of corn in the husks per quart of finished canned corn. Husk the corn and pick off as much of the silk as you can. A soft vegetable brush is the fastest and easiest way to get the remaining silk off - just don't be too rough with it. Obviously, if you are canning the corn on the cob, skip this step. 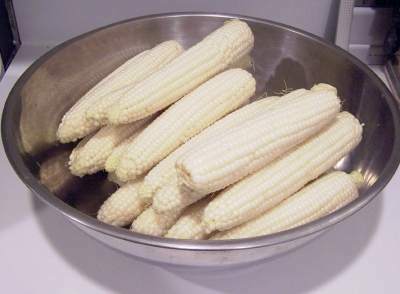 Whole Kernel Corn - Cut kernels from cob about 2/3 to 3/4 the depth of the kernels. I hold the ear by the small end, and slide the knife down the ear. See the next photo. 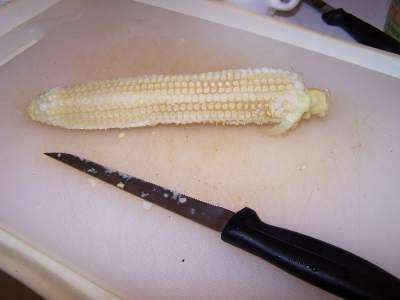 Cream Style Corn - Cut kernel tips about 1/2 deep and scrape the cobs with the back of a knife to remove the juice and the heart of the kernel. 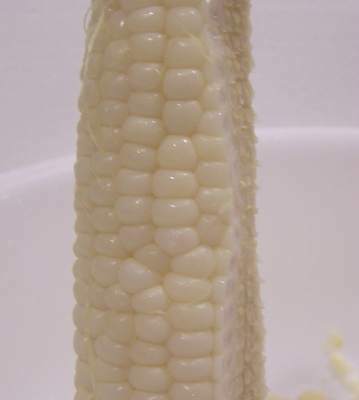 Another way to prepare cream style corn for canning is to cut and scrape the corn from the cob without blanching. 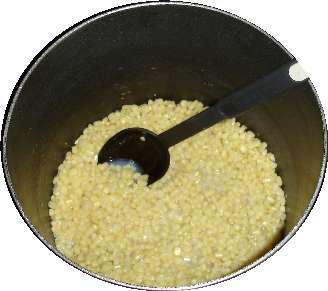 Place the cut corn in a double boiler, and heat with constant stirring for about 10 minutes or until it thickens; allow to cool by placing the pan in ice water. 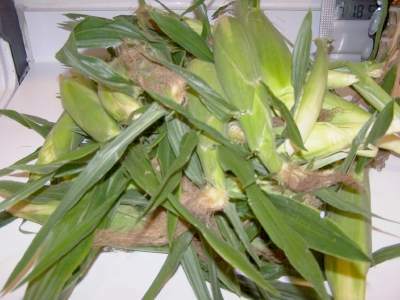 As the corn piles up in your bowl, it will look like this! 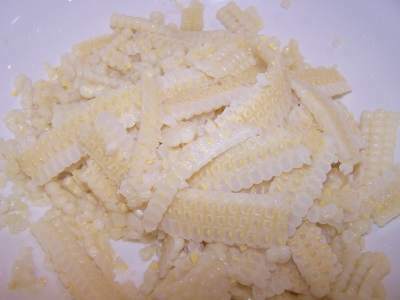 Close up, the corn comes off in strips. As you put these in the bag, they will easily separate into separate kernels. Now is a good time to dice the peppers, celery and onions! in a saucepan. Bring the mixture to boil and simmer for 5 minutes, stirring occasionally. in with 1/2 cup of the simmered mixture. Add this mixture and the corn to the hot mixture in the pot. Simmer for another 5 minutes. If desired, thicken mixture with flour paste (1/4 cup flour blended in 1/4 cup water) and stir frequently. This is called "hot packing"! 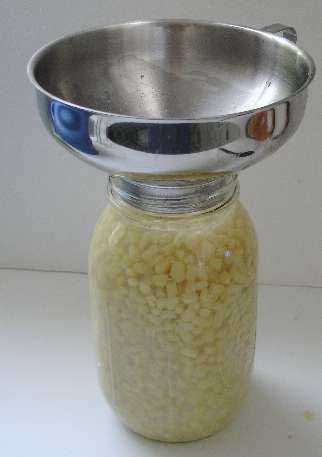 Fill the jars with the corn mixture, leaving 1/2-inch headspace. Pack the jars fairly tightly, but be sure to leave 1/2-inch of space at the TOP of the jar. That is called "headspace" and is needed for expansion during heating in the water bath. The chart below will help you determine the right processing time and pressure, if you have a different type of canner, or are above sea level. 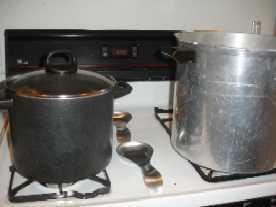 For most people, using a plain open water bath canner, the time will be 15 to 20 minutes. You can use either a plain water bath canner OR if you only have a pressure canner; just don't put the weights on it, which uses it as a water bath canner. Recommended process time for Pickled Corn Relish in a boiling-water canner. Q. 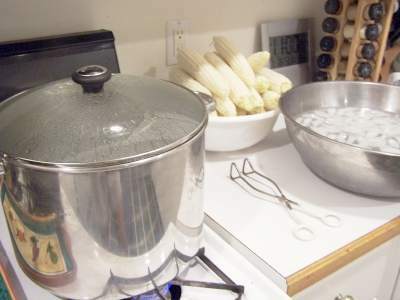 Is it safe to can pickled corn relish in a traditional water bath? If so how long do you do process them? for safe hot water bath canning. 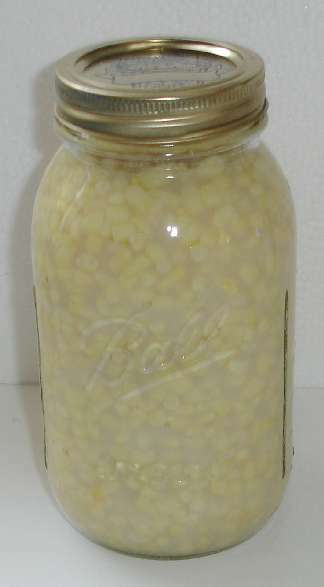 Corn is low acid food and may only be processed safely in a pressure canner unless it is pickled. Lemon juice or vinegar is recommended to acidify tomato products for safe water bath processing; but use an approved, tested recipe.